No need to worry, everything is fine! It’s just that a mysterious dark vortex has opened up in the skies over Neptune. Hubble just snagged a picture of a dark vortex looming over Neptune during a May 16th view of the planet. 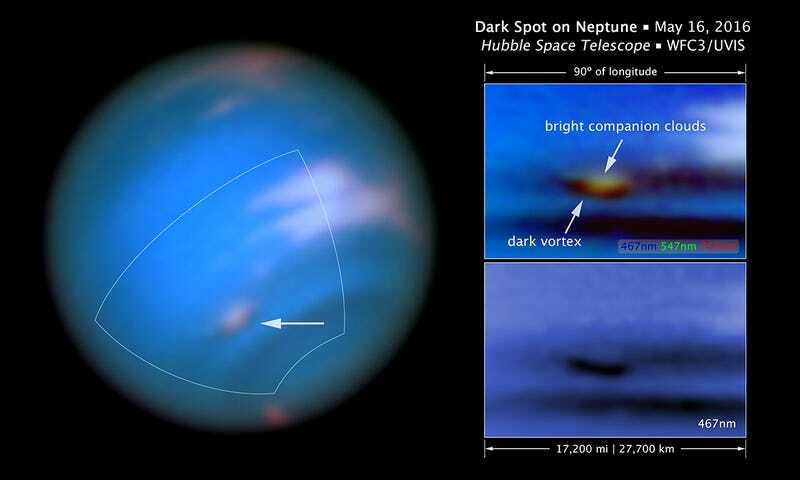 This is actually the third documented sighting of a dark vortex in Neptune’s atmosphere. It was seen in 1989, during a Voyager fly-by. Then, in 1994, Hubble spotted the strange feature again. All the dark vortices have a cloud of frozen gas, topped with bright clouds, but all the other features appear to be completely changeable. Differences in size, shape, and the duration they last has been noted among all the observed dark vortices. Although this is the first time the strange feature has been spotted in 22 years, researchers suspect that other dark vortices have passed through Neptune’s atmosphere unnoticed in the meantime. In particular, an incident in 2015 raised suspicions, when astronomers worldwide reported seeing bright clouds in Neptune’s skies. Ultimately, though, they couldn’t confirm a sighting of a dark vortex beneath them. Now that they have a better look at Hubble’s view of one of Neptune’s dark vortices, researchers hope to get a better understanding of just why they form and why they eventually disappear.